Dan King didn’t start running with a goal in mind; he was simply keeping his daughter company on preseason workouts for high school basketball. He couldn’t run more than a quarter mile at first. But the more he ran, the more comfortable he felt. In a short time, he was running three miles. So when a friend posted racing photos on social media, he entered his first 5-K and was hooked. Despite having ankylosing spondylitis, an autoimmune disease that affects the joints, he went on to finish a marathon and start checking other “never haves” off his bucket list. He has dropped 62 pounds since he started running in 2010. Last year, he ran up a mountain, raced a 10-miler, finished 2 half-marathons, and made plans for more. Want to share your story? Or tell us about an outstanding Maine runner you know? Write to us! Family: Wife Josee, two children, Doria (sophomore at University of St. Thomas), Ethan (sophomore at Kennebunk H.S.) and Peaches, our cat who is anything but peachy. The highlights of my running life so far... Definitely the Twin Cities Marathon in October 2014. In quiet moments, I still find it absurd to think I did it (and am preparing for more). I’m also really proud that in 2014, I accomplished so many firsts: I ran up a mountain (Winter Wild Series at Sunday River), I ran a 10-miler (Mid-Winter Classic), and I ran two half marathons, in Stillwater, Minn. and Newburyport, Mass. My go-to piece of gear: .It’s a toss-up between cold-weather tights and Runkeeper. My mantras: Go out hard and hold on. Change it up. Seek challenges. Have fun. What’s the biggest obstacle to training and how do you get over it? Developing the habit and making a commitment to stepping out the door. At a certain point, though, it becomes ingrained and now I can't imagine not getting out there ... no matter the weather. What’s the most rewarding part of your running life? There have been lots of them. New friends and old friends. Being outside and observing. Urban or rural doesn't matter, I always see something I wouldn't have noticed otherwise. Above all, the biggest reward has been the look on my rheumatologist's face when he learned I'd run a marathon. What advice would you give to someone who is just starting out? Don't overdo it. Get comfortable and gradually increase your distance. Enjoy the scenery. Enter a road race and don't compete with anybody but yourself. And get fitted for quality shoes. It's the best investment and can help reduce the risk of injury. I learned the hard way on both accounts. What kinds of changes did you make to your you daily eating habits? I stopped drinking soda. Just cut it out completely. I'll have a Coke once in a while as a treat, but I haven't missed soda at all. I also cut way back on chips to the point where I don't need them with a sandwich. That was tougher, but especially when I'm training for a big race, it's another thing I can push aside. I also ate fewer potatoes, especially french fries. I cut down on breads. When I do have bread I make healthier choices, like whole wheat and 12 grain. As I started to feel better, I began to learn about and adopt a much more runner friendly diet. I ate more fruits and vegetables and whole grains, and less processed food. I haven't given up foods I like, just have become much more moderate in the approach. One of the best benefits of training for the first marathon is the knowledge that I can exert discipline and control how I feel on the road with my fueling choices. What’s next: I’m getting ready for Maine Coast Marathon in May, although it's a bit difficult right now for obvious reasons. 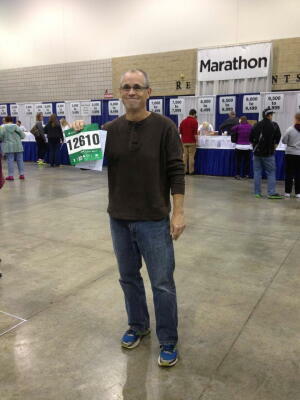 A former classmate and teammate from junior high school in Illinois is coming out to run it. I haven’t seen him since my last day of eighth grade in 1975. We reconnected on Facebook and he's on a quest to run a marathon in all 50 states. Maine will be No. 25. I’m also hoping to do the Mt. Washington challenge in June. How have you stayed motivated and fit during such a tough winter? I don't have access to a treadmill so it's outdoors or bust for me. I sign up for challenges that help me stay motivated, along with races. Last year, I took part in Maine Track Club's Holiday Streak. This year I'm in the middle of the Crow Athletics 100 Day Streak (this runs from January to April). When I absolutely cannot run my normal routes because it's too hazardous, I drive myself to the beach and get three to five miles in down there where the roads are largely deserted. I've run in some nor'easters with the surf pounding the sea wall and it's amazing. I have to admit, though, this stretch has been frustrating with crowded roads, angry drivers, bad sight lines, and bad footing. My favorite aspect of doing this is being able to walk out the door and go.